The Lez Watson Inexperience Blog – A personal addition to my award losing website. Slowly, slowly and then fastly fastly the countryside surrounding our towns is being eaten up by ‘the concrete monster of progress’. I am mapping the recent and future development around my town, based on Ordnance Survey 1:25,000 mapping, local planning documents, and a variety of sources. It’s eight months since I began posting about the ‘ungreening of England’ (http://wordpress.watsonlv.net/index.php/2018/07/25/the-ungreening-of-england-burton-area/) adding more information to the map of the Burton-on-Trent area, thus making substantive revisions each time. This updated map includes a proposed development (aka land grab) to the west of the town called Postern Park which will include up to 750 houses, a secondary school, playing fields, ‘retail/community’ and formal open spaces. “The site currently has agricultural use, principally pasture, but also an Adventure Farm, which has a hard surface car park, play area and animal enclosures, accessed north of Postern Farmhouse, off Postern Road. The existing Grade 2 Listed farmhouse is only visible from a narrow stretch of Postern Road to the south, and is wrapped by existing farm buildings.” In no way can this pleasant area of grassland along the Needwood Forest eastern boundary be considered a ‘brownfield’ site. This land grab is in addition to 2,500 homes to be built at Branston Locks, as well as 300 homes to the south of Forest Road and up to 250 homes at Lower Outwoods Road. The total number of new homes on the map is now approximately 10,600. Following the post-war release of Tatenhill aerodrome by the RAF to the Duchy of Lancaster’s tenants in c1953, it was disused for a few years, The Burton-Newborough road (B5234), which traverses the site, had been closed ‘for the duration’ and was reopened in May 1954. In 1959 the Burton upon Trent based Ind Coope brewery, who had a fleet of executive aircraft based at Burnaston airfield, acquired the lease to Tatenhill and transferred its operations there. On the north-east side of the perimeter track the company erected a remodelled, re-used Bellman hanger with a new control tower and office suite attached. At first only the eastern two-thirds of runway 08/26 was used. The other runways deteriorated rapidly and were used only occasionally. Runway 16/34 became disused very quickly while 04/22 was soon suitable for light aircraft only. Runway 08/26 was later extended to its present length of 1200m (1312 yds). A radar facility was erected at the convergence of 08/26 and 16/34 to deal with the dense winter fogs encountered over the Needwood Forest. By the end of its operation the company had a Beechcraft King Air 90 and a Beechcraft King Air 200. A highlight for all the staff at Tatenhill was a visit by HM the Queen in 1982 who, after visiting the Duchy of Lancaster estates in the Needwood Forest, flew out from the airfield in a Royal Flight aircraft. Laurie Walford, Dave Moon and other members of the team were presented to her before she departed. The wartime watch tower became derelict during this period and was considered structurally unsafe. Concern was expressed that children using it as a playground might be injured and it was demolished in 1982/3. The years 1984-5 saw large cutbacks at Allied Breweries which resulted in the closure of operations at Tatenhill in July 1985. The workforce, including Laurie Walford and Dave Moon, were made redundant and the aircraft sold. Thus ended a period of over 25 years private flying from the airfield. Based mainly on information from Laurie Walford, Dave Moon and Fay Insley employed at that time by Ind Coope. AMWD plan nos. 13726/41 and 15683/41. Resignation from the British Labour Party. I joined the Party a couple of months before the General Election that brought Mrs Thatcher into power. I was ‘inducted’ by ‘Red Ted Knight in Brixton and was active in London, in Burton and elsewhere during the 1980s and 1990s. I believed that a Socialist society was the only alternative to rampant Toryism of the time. Both of my parents are lifelong Labour supporters. It was in the blood. My decision to leave has evolved since the Iraq war and the financial crisis of 2007–08. I consider the crisis has exposed the contradictions and weaknesses of the neo-liberal economic experiment: attempting to make global corporations and capitalism profitable by making the rich richer at the expense of working people. This began in the early 1970s, it influenced the 1974–79 Labour Government; was extensively implemented by the Tories 1979–1997; little modified by Labour 1997–2010 and has been accelerated by the current Tory government. This near decade of economic depression has exposed this agenda for all to see and created the conditions for truly radical change. Any challenge to the neo-liberal agenda has now been compromised by the One Nation Labour approach based upon ‘responsible capitalism’ epitomised by the Union Jack emblem that would fit the Tories just as well. Austerity has now been accepted by the Party and is being implemented by Labour councils up and down the UK under the ‘dented shield’ rhetoric. Iraq, Afghanistan, Palestine, elsewhere. It’s hard to know where to start. I didn’t join the party shortly after the ‘fall of Saigon’ expecting to find the government and it main so-called opposition party 35 years later pursuing Armed conflict around the world – more than ever in history. Along with our ‘allies’, Britain has invaded and desolated so many countries that I cannot, with honesty, support a party that talks peace but promotes wars. I believe Labour’s foreign policy is merely an ersatz version of the corrupting Tory (neo-con) ambition abroad. I feel the austerity ‘Lite’ promoted by the Labour leadership is hypocritical. Fighting the Tories by Tory defined rules is simply unacceptable. For the above, and other, reasons I am no longer able to vote Labour or be a labour supporter. Will you please remove me from the membership list and cancel my direct debit. Unsurprisingly, I didn’t receive a reply. I then went off to sign up with the Green Party. More my kind of guys/girls. The base map is from The Development of Industry in Burton upon Trent by CC Owen (1978). It remains unsurpassed, available in a charity bookshop near you. The map shows the overall development in Burton up to the date of the book’s publication during the housing boom of the mid 70s. Comparison with the current Ordnance Survey Explorer Map sheet 245 also allows an appreciation of growth from then to now. The ungreening of England: Burton area. Christmas edition. Slowly, slowly and then fastly fastly the countryside surrounding our towns is being eaten up by ‘the concrete monster of progress’. 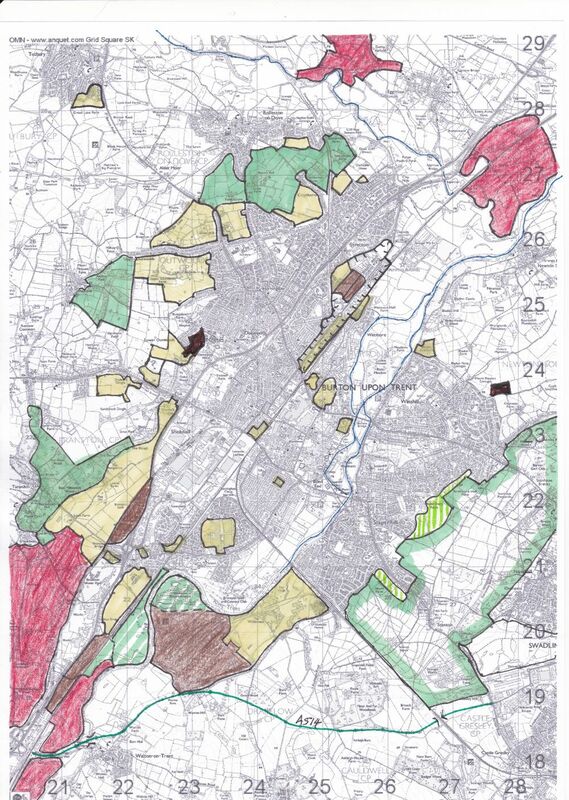 Here’s a local example; based on Ordnance Survey 1:25,000 mapping and a variety of sources, I give you an updated sketch map showing recent and future ‘development’ in the Burton area. The ungreening of England: Burton area. Slowly, slowly and then fastly fastly the countryside surrounding our towns is being eaten up by ‘the concrete monster of progress’. Here’s a local example; based on Ordnance Survey 1:25,000 mapping and a variety of sources, I give you a sketch map showing recent and future ‘development’ in the Burton area. Green line – possible route of A514 connecting road (A38 to A50 nr Derby). Click on the title above for an updated map. Posted on 25th July 2018 1 Comment on The ungreening of England: Burton area. I voted not to leave the EU at the recent referendum. That does not mean that I wish to stay in the EU either. I was 20 years old when I voted to join the European Economic Community (as it was then) in June 1975. I imagined that, coming from a Labour party voting family, Britain was joining a confederacy or brotherhood of equals, despite The Labour Party having ‘no official position’ on Europe. That referendum, which was strongly felt be unconstitutional by some legal experts, favoured entry to the EEC by 67% of those who turned up at the polling stations (65%). I joined the Labour Party in 1979. I realised, even at that tender age, the Tories – under Thatcher or not – were determined to undermine and ultimately destroy the social welfare system, including selling off the all the public utilities and lastly the NHS. I was an active member during the 1980s but my scepticism about the Party increased during the following decade. When Blair came to power it seemed the damage done by the Tories in the previous decade might be halted or reversed. Not to be. Blair – or the Blue Mole, as I came to see him – simply did the opposite. Third Way my arse. I left the Party after having been a member for 35 years. Meanwhile, the EEC had morphed into a continental corporation, dominated by federation junkies, and becoming an ersatz United States of Europe. Britain sat in the corner only partially buying into ‘the dream’. If I had have wanted to be in a ‘united states’, I’d have emigrated to the U.S.A..
Then came along that toad Cameron – the Pontius Pilate of the 21st century. Just when we thought the EU squabbles couldn’t get worse, he made sure they did. He abandoned parliamentary democracy (such as it was), backed the weakened horse, lost his bet, and then simply WALKED AWAY. When Britain voted by the slimmest of possible margin to leave the EU, this country, as far as I’m concerned, lost what little influence it had and has cast us all into a fire of anarchistic so-called free trade. Britain will walk away from the Frenchies and the Krauts, et all with nothing. No authority on the world diplomatic stage and no economic leverage, no ‘face’. Well done Britain. Posted on 24th July 2018 Leave a comment on Brexit and me (abridged).